This building on 6th Avenue and 46th Street has had two sets of "Condo for Sale" signs up since spring or even earlier. 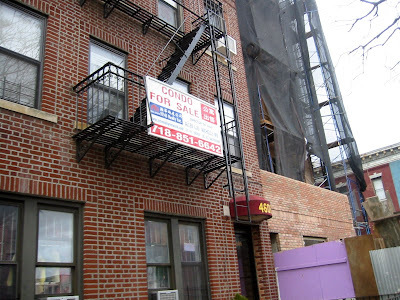 Along with the skinny condos for sale around the corner on 46th Street, very few - if any? - have sold. It's not clear whether they are still available for rent...have they already rented? Anyway, since June of this year, the corner lot on 6th and 46th has been growing into a multi-unit building for which I had high hopes due to the quality of the fencing and planning. Now, the Fedders a/c shields have gone up, and even though there is a balcony on the first floor, and the brick has a certain pattern that shows more than a thrown-together care for the aesthetic, I have been let down. Sure enough, this seems like it will be just another crop of less-than-stellar, yet overpriced condominiums that may very well end up as rentals. Given that the NYC economy has turned bad, and is likely to get even worse before this is all over, you're probably right that this will turn into another set of rentals. Awful timing for the builders, bringing both sets online as the economy went to crap.